UTRGV men hoping for history to repeat against Grambling St.
EDINBURG — The last time the UTRGV men’s basketball team played Grambling State in a postseason tournament, the team then known as Pan American College went on to win an NAIA National Championship. Now, 56 years later and at the NCAA Div. I level, these two teams meet in the postseason once again, this time in the first round of the CollegeInsider.com Tournament (CIT) at 7 tonight at the UTRGV Fieldhouse. Despite playing for the first time in 1963, UTRGV and Grambling State have played each other only six times, with UTRGV going 4-2, including a 2-1 mark at home. This is the third year in a row in which UTRGV and Grambling State are facing off, splitting the last two games, including an 82-76 home loss for UTRGV last year. Despite that game being only a year ago, this is a very different UTRGV team. Four of the five UTRGV starters in that game have moved on and of the 11 players who took the court, only four are back, and they combined to play just 73 of the 200 available minutes. 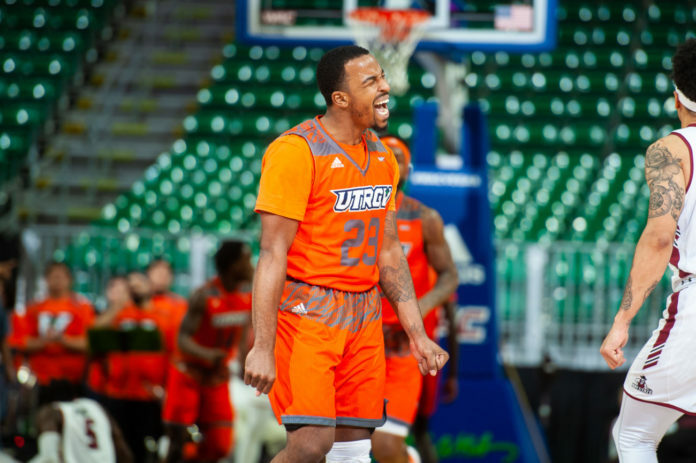 UTRGV is no stranger to the postseason, having appeared in the College Basketball Invitational last year, losing at New Orleans, which is in the CIT this year, 77-74 in the first round. Not only do the eight returning players have that experience under their belts, but so does Tyson Smith, who was part of the Loyola-Chicago team that made a run to the Final Four last year. As a program, UTRGV is 17-11 all-time in nine previous postseason tournaments, including a 5-2 record at home. All of those home games occurred in the early- to mid-60s, though, before the fieldhouse was built. This is the first postseason men’s basketball game in the history of the fieldhouse. Before the season began, Hill stated that one of his goals as he builds the program is to always be plus 5. The team won 10 games in Hill’s first season and 15 games last year. At 19 wins, UTRGV needs to win one more game to be plus 5 for the second year in a row. Regardless, UTRGV (19-16) is in the midst of what is tied for the 12th-winningest season in program history and the winningest since 2001-02 (20-10). The program record for wins is 28, set in 1963-64. The NCAA Div. I program record is 22, set in 1974-75 and matched in 1977-78. UTRGV can finish with up to 24 wins by winning all five games in the CIT. The CIT utilizes the old NIT model in which there is no set bracket. Future round opponents are determined by the results of the previous round. There are 26 teams in the CIT and the top three seeds remaining after the first round will receive a bye to the quarterfinals. The CIT has not made clear who is in contention to be considered a top-three seed. All games are contested at on-campus sites, meaning the potential exists for UTRGV to host up to four more games depending on opponents. The first and second rounds run through March 25 while the quarterfinals run March 27-31. The semifinals are set for April 2 and the championship on April 4.